Part one: Why we should watch for Christ’s return. Part two: What the Christian waiting for Christ’s return should look out for. Part three: Why the Saviour warned of deception in the last days. Part four: Events in Israel which will herald the return of Christ. Part five: Signs in the heavens. Part six: The rising again of the city of Babylon. Priests brawl in Bethlehem’s Church of the Nativity – “No one was arrested because all those involved were men of God.” REALLY!! Are the victims of Enniskillen (Poppy Day Massacre) any nearer the truth? Union Jack days numbered at City Hall? Captain Terence O’Neill made much the same pitch to Catholics as Peter Robinson is doing now – or Robbo is Terence O’Neill without the lisp!! IRA victim’s daughter Manya Dickinson confronts IRA bomber – he just laughed in her face! Back in October of this year, a copy of an invitation issued by the Northern Ireland Assembly Christian Fellowship, along with an introductory leaflet about the NIACF, came into my possession. The invitation was to a meeting at which the Chief Constable of the Police Service of Northern Ireland was to speak. The above article appears on www.mrulster.org. Please note that we do not necessarily endorse external content. This article is reproduced for information purposes only. What is wrong with Jesus Christ Superstar? A sermon preached by Rev. Brian McClung, Sunday November 6th, 2011. 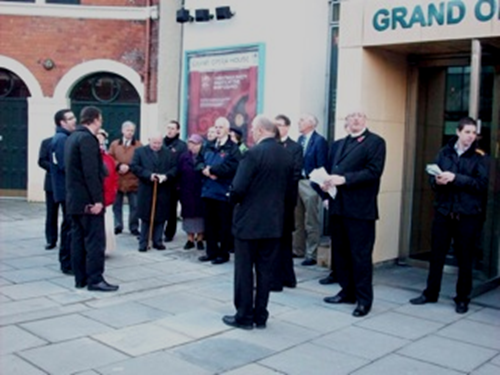 Forty years on, musical is still blasphemous – Belfast Telegraph report. 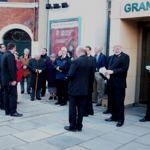 Maynooth Community Church: Promoting the Jesuit Cause. The ongoing apostasy within the Presbyterian Church in Ireland may be clearly seen in this article which was recently mounted on Mr Cecil Andrews’ site, Take Heed Ministries. I am reminded of what Paul the apostle said to the Thessalonian church in 2 Thessalonians 2:7. “For the mystery of iniquity doth already work . . . ” It is most certainly at work today as we near the revelation of the Antichrist, “whom the Lord shall consume with the spirit of his mouth, and shall destroy with the brightness of his coming,” 2 Thessalonians 2:8. We honour brother Andrews and his witness for truth in these evil times. This is our first study in what I believe will be an interesting and beneficial series of prophetic studies. We will endeavour to look at God’s revelation of the events which He has said will take place just prior to the return of the Saviour to rule this world. We wish to start our series by looking at why we should consider such a subject. Some might believe that it is folly to stare into the future and try and anticipate what will happen amongst the nations at the end of this age. If such a study is folly then the folly began with the Lord Who revealed these things to us and commanded us to give consideration to what He said. Read the article. I have often used the illustration of the directions given to a traveller becoming more and more detailed as he nears his destination to show that so it is with prophecy. I am convinced that God’s people will be able to tell, with increasing confidence, the time of the Saviour’s return as that wonderful event draws near. There will come a time when true believers will know to look up for the time of Christ’s return has come. “And when these things begin to come to pass, then look up, and lift up your heads; for your redemption draweth nigh,” Luke 21:28. Part three: Why the Saviour warned of deception in the last days. NEW! “Jesus answered and said unto them, Take heed that no man deceive you,” Matthew 24:4. What about price of not having death sentence? What is it like to keep top state secrets? Is removal of Royal Catholic ban prudent? Doctors ORDERED to treat elderly with respect… but shouldn’t that go without saying? “Likewise also as it was in the days of Lot; they did eat, they drank, they bought, they sold, they planted, they builded; but the same day that Lot went out of Sodom it rained fire and brimstone from heaven, and destroyed them all. Even thus shall it be in the day when the Son of man is revealed,” Luke 17:28-30. McGuinness – If he’s not Presidential material down there, why is he deputy First Minister material up here? Soldier’s son highlights inconvenient truth about SF – Sinn Féin is seeking retrospective endorsement from Irish State for campaign of terror waged by Provisional IRA. He could still be arrested. So is this the real reason McGuinness denies he was in the IRA after 1974? “Martin McGuinness and Gerry Adams . . . . . . . are so well disciplined and so well honed that no interviewer gets anywhere with them. You get nowhere with them because they lie. They lie all the time. They don’t mind lying and they’ve rehearsed their lies and they’ve been trained to lie, and that’s what they’re doing.” Read more. Scotland prop Euan Murray on why he refuses to play on Sundays and will not watch their first match. Read more. McGuinness is too tainted by IRA crimes for President’s office but not for Deputy First minister – Irish columnist’s double standards!! Click here for more. First Minister’s office caught out again in lying about its funding of sodomite organisations!! Read more. A RETIRED senior PSNI officer has expressed scepticism about Martin McGuinness’s claims to have left the IRA by 1990 – and intelligence from the Irish and US governments strongly supports his case. See also: Don’t let McGuinness fool you – he’s a fanatic with hands drenched in blood. An article on Martin McGuinness which shows just a little of the terrorism he espoused. Southern Health & Social Care Trust pays out over £20,000 to sodomite groups. Over the last five years, the Western Health & Social Care Trust has paid out over £153, 000 as was stated in a communication from it. Figures released by the Belfast Health & Social Care Trust indicate that over £36,000 was paid out to sodomite organisations since 2008. Strabane District Council pays nearly £14,000 to sodomite organisations since 2007. Another district Council, Strabane, has disclosed the amount that it has paid to sodomite organisations over the last few years. It totals out at nearly £14000. Northern Ireland Housing Executive (which presently comes under Nelson McCausland’s remit as Social Development minister) pays out £9000 to sodomite organisations. Police in NI fund sodomites to the tune of £45,9292.70 over 5 years!! Belfast City Council’s support for sodomites. Integration with society by sodomite organisations which is leading to an acceptance of this perversion.